Many poker professionals are very vocal these days about the threat posed by highroller tournaments, who tend to become the flagship events in prominent poker series. These players claim that due to the fact that poker pros are allowed to make virtually unlimited rebuys in the early stages of these tournaments, the prize pools get out of proportions. Regular players have little chance to compete against these poker titans, as they lack the resources needed to level the playing field. While the debate is raging about whether highroller tournaments should be included in these poker series, there are plenty who support these events. Dave Shallow is one of the fans and he has a brand-new reason to uphold his principles, as he emerged victorious in the UKIPT Nottingham High Roller. What usually happens is that highroller tournaments only attract double-digit numbers, since there are not many willing to pay a significant amount to buy in. What made the United Kingdom and Ireland Poker Tour different was the fact that the buy-in didn’t set players back more than £3,000. A total of 101 players sat down at the tables, which means that £303,000 were collected and bound to be split among the most successful players. The ones who got the biggest slice of the cake with those who made the final table and at the end of day one, 13 players were still in the race, with decent stacks in front of them. Those who made the final table knew that the first to be sent to the rail would only win three times more than he invested. As a result, they shifted into a less aggressive gear and waited for opponents to commit mistakes, but there were several notable exceptions. Dave Shallow and Richard Keller chose an entirely different path and they pushed their opponents into corners, by playing overly aggressive. One by one, the other players succumbed to their bold style and eventually they were the only ones still standing. It is customary for the last players in prominent tournaments to discuss the terms of a potential deal and this is exactly what happens at the UKIPT Nottingham High Roller. 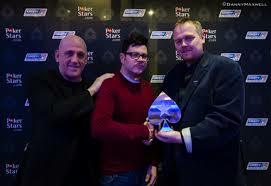 Dave and Richard found no reason to play until the final hand was dealt and instead decided to split the prize evenly. They kept playing just for the honor of lifting the trophy, which eventually belongs to Dave Shallow, but both of them got £68,000.